The “Fury Tour” kicks off this Friday, October 14! 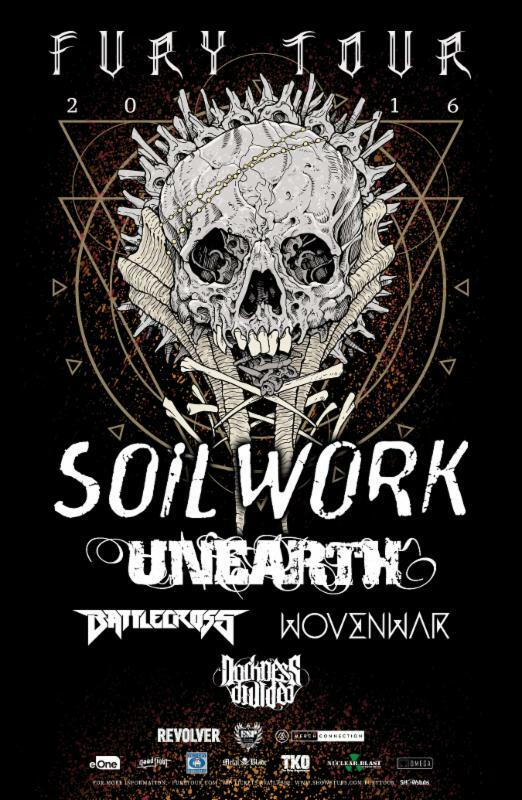 Headlined by Swedish melodic metal legends SOILWORK, the “Fury Tour” will also feature support from heavyweight metal bands Unearth, Wovenwar, Battlecross and Darkness Divided. Tickets are available now via www.furytour.com, and VIP packages are available through Show Stubs via www.showstubs.com/furytour. Headliners and Swedish metal leaders SOILWORK have been churning out melodic heavy metal masterpieces since their formation in 1995. The band recently released a special collection of rarities, Death Resonance, via Nuclear Blast. They are also touring in support of their latest full-length album, The Ride Majestic. The Ride Majestic charted internationally upon its release, hitting the Billboard Top 200 in the US, and is available to order now in CD,vinyl, or digital formats. Unearth is touring in support of their latest release, Watchers of Rule, released in 2014 via Entertainment One Music (eOne). The album marked their eOne debut and saw a Top 10 Billboard Hard Rock Albums chart debut, as well as a Top 200 debut. Unearth originally exploded onto the scene with their 2001 debut The Stings of Conscience, and followed with metal favorites The Oncoming Storm and III: In the Eyes of Fire, both of which solidified them as one of the top metal acts of the new millennium. They are currently writing their follow up to Watchers of Rule. Read more about Unearth here. Darkness Divided will be touring in support of their self-titled sophomore release, heralded by New Noise Magazine as the album that will “establish Darkness Divided as major players.” The Texas metal disciples recently released a music video for ‘Back Breaker,’ and will be demonstrating their groove-laden technical metal that refuses to conform to one style.